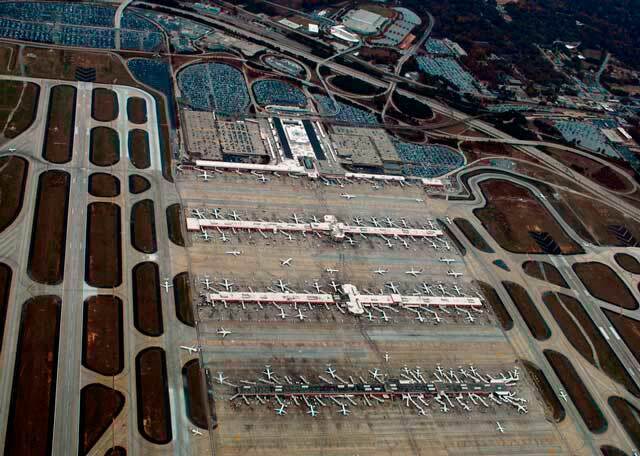 Use this website to quickly find the most important information about the main airport in Atlanta, called Hartsfield-Jackson Atlanta International Airport: Departures, Arrivals, Parking, Car Rentals, Hotels near the airport and other information about Atlanta airport. 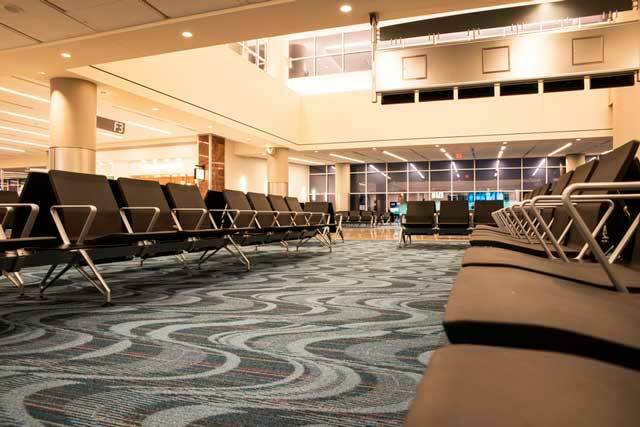 Plan your travel to ATL Airport with the information provided in this site. Atlanta Airport, known officially as Hartsfield-Jackson Atlanta International Airport (IATA: ATL, ICAO: KATL, FAA LID: ATL), is located 7 miles (11 km) south of the business district of Atlanta, in Georgia, US. 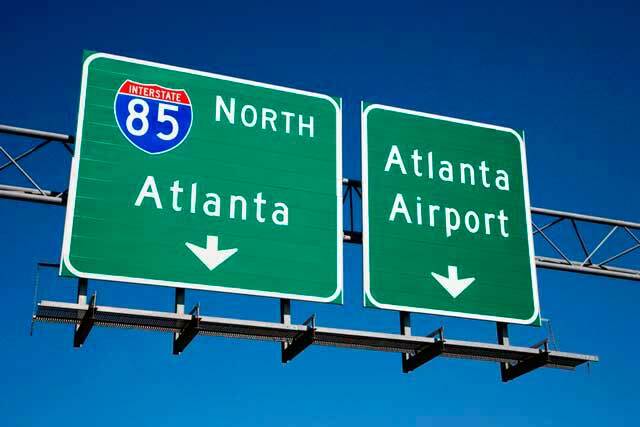 Atlanta Airport (ATL) is located 7 miles (11 km) South of the business district in Atlanta. Hartsfield-Jackson Atlanta International Airport serves as a major hub for travel throughout the South and East of the United States. The airport has two terminals: the Domestic Terminal for flights in USA and the Maynard H. Jackson Jr. International Terminal for international flights. In 2017 Atlanta Airport handled more than 103M passengers per year, being the world’s busiest airport by passenger traffic. Seven parallel concourse buildings serve passengers boarding and are located between the Domestic Terminal and Mayanard H. Jackson, Jr. International Terminal. Atlanta Airport consists of 209 domestic and international boarding gates. It serves as a major hub not only for flights throughout the South and the East of the United States, also to Central and South America, Asia and Africa. ATL Airport is the primary hub of Delta Air Lines (and Partners), and also for some low-cost carriers such as Frontier, Southwest and Spirit. The five busiest domestic routes from Atlanta Airport are Orlando, Fort Lauderdale, New York, Los Angeles and Tampa in Florida. The five busiest international routes from ATL airport are Amsterdam (Netherlands), Paris (France), Cancún (Mexico), London (Heathrow) and Toronto (Canada). In 2017 Atlanta Airport (ATL) handled more than 103M passengers spread between domestic flights (90M) and international flights (11M). It means that the traffic at the airport has increased more than 3% and this is the maximum capacity (in terms of passengers) that the airport has handled. It is since 1998 the world's busiest airport by passenger traffic. Atlanta Airport consists of two terminals: The Domestic Terminal and the Maynard H. Jackson Jr. International Terminal with 209 domestic and international gates. There are seven parallel concourse buildings (From A to F and T) located between the two terminals to accommodate passengers. It is divided in two sides for check-in, baggage claim and ticketing: Terminal North and Terminal South. Delta Airlines is the only airline located in South Terminal. In Terminal North there are located all other domestic airlines. Most domestic flights arrive and depart from concourses A, B, C, D or T. These concourses are located between Domestic Terminal and International Temrinal. Atlanta Airport International Terminal handles all the international flights, either concourse E or F. Hartsfield–Jackson held its ranking as the world's busiest airport in 2012, both in passengers and number of flights. 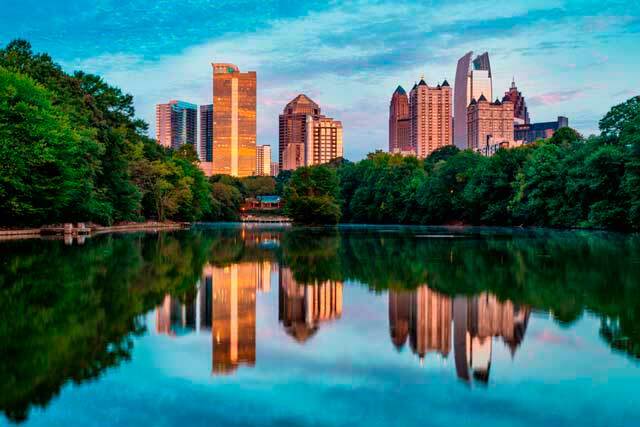 - Shuttle: There are a lot of hotels in the surroundings of Atlanta Airport which provide free shuttle service to and from the airport. - MARTA: Local Public Transit (MARTA) is the local public transportation system. From and to Atlanta Airport, Red and Gold lines are available. - Greyhound: Greyhound stands for a private bus company that offers services at Atlanta Airport to several cities in the US. 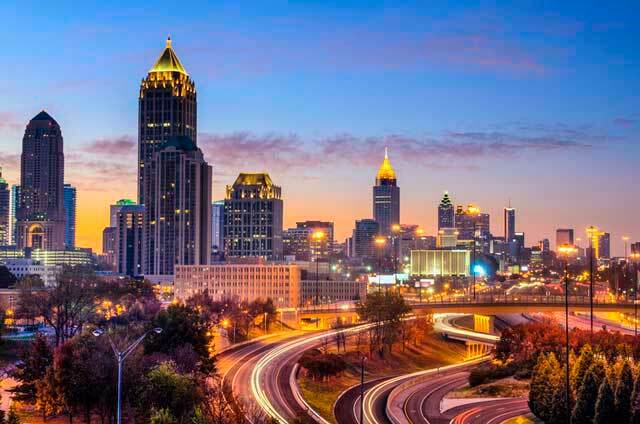 - AMTRAK: AMTRAK services are available at downtown Atlanta. To get there, please take a taxi or a door-to-door service from ATL Airport. - Taxi: The Taxicab service in Atlanta Airport is located in the Yellow Bus aisle. It is possible to transfer to Atlanta Business District within 16 minutes by taxi. Atlanta Airline Terminal Corporation Télephone: (404) 530-2100 ext.100.